By Stephen W. Austen, #161, The Spaatz Association President, 2000. Earning the General Carl A. Spaatz Award was the payoff for years of toil in the CAP Cadet Program. Only after the final hurdle, a daunting battery of tests–objective, subjective, and physical–was one “pinned” with the coveted triple diamonds of a Cadet Colonel. The other Spaatz Award elements (the certificate, and, at one time, a nifty little special ID card) were usually awarded later with as much pomp and circumstance as CAP Regulations and local policy would allow. Those who earned the award will always remember the extra “weight” those little diamonds put on the shoulders, literally and figuratively. “Now what to do?” Each Spaatzen faced the same challenge. The prospect of a brief reign from this pinnacle of accomplishment was some comfort. However, as the final year of a cadet career wound down, the idea of a “demotion” from the cadet ranks could seem a dismal prospect indeed. Imagine the thought, however fleeting, that your Civil Air Patrol career had somehow peaked…. Some left the cadet ranks for a prestigious appointment to a Service Academy or to progress into an advanced ROTC program (with a scholarship). These were worthy personal accomplishments built on the solid foundations achieved in the Cadet Program. These events seemed to demand additional recognition, or at least a consolation prize. 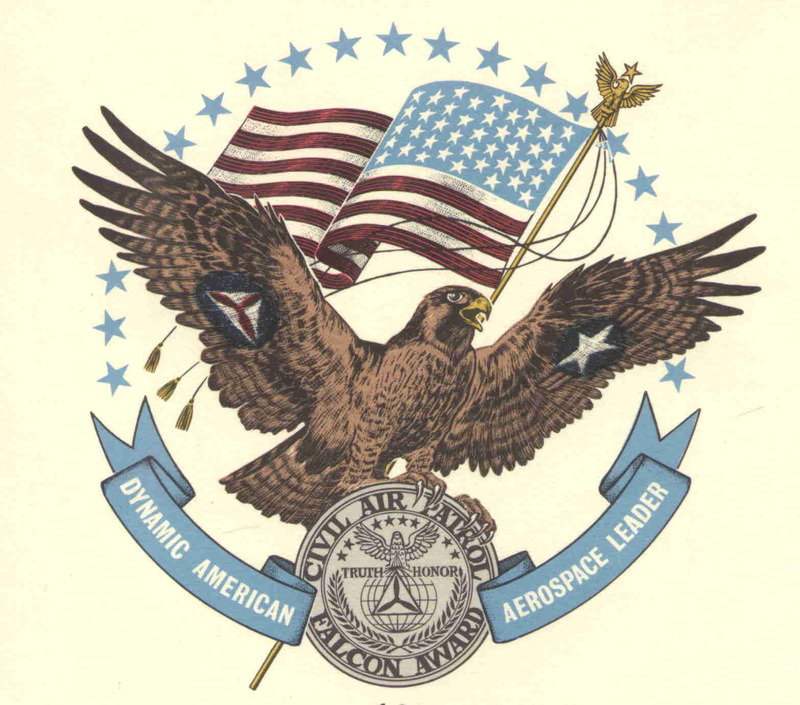 The Falcon Award Seal, c 1964. Enter the Frank Borman Falcon Award. This page is about the history of the award, from its beginning in 1964 to its rescission in 1979. It is also intended to preserve a record of this legacy for the Spaatzen who were proud to earn the Colonel Frank Borman Falcon Award. In December 1963, the Civil Air Patrol News outlined the “New Cadet Program.” The 15 progressive achievements, named after CAP and aerospace pioneers, were designed to be accomplished in four distinct phases. The program became mandatory for all cadet units on 1 July 1964. Successful completion of this phase resulted in promotion to Cadet Basic. This phase included six achievements to be accomplished in any order as a cadet advanced through the cadet enlisted and NCO grades. Successful completion of Phase II, plus attendance at a summer encampment entitled the cadet to the General Billy Mitchell Award, the CAP Certificate of Proficiency, and promotion to Cadet Master Sergeant. This phase consisted of eight achievements to be completed in any order. Completion of one achievement was rewarded with promotion to C/2Lt. Completion of any four achievments earned the cadet the Amelia Earhart Award and promotion to C/1Lt. Promotion to C/Capt and other Cadet field grade ranks followed a table of eligibility based on completion of additional achievements. Completion of all achievements in Phases I, II, and III, plus other requirements outlined in CAPM 50-6 earned the General Carl A. Spaatz award. This honor was tightly controlled–tests were administered by National Headquarters–and resulted in numbered awards for recipients. Phase IV was dubbed the “final phase of the new program.” Satisfactory completion of this phase earned the cadet the Falcon Award, designated as the highest award given in the Cadet Program. Secured admission to the Air Force Academy and successfully completed the second year of instruction. Secured admission to advanced Air Force ROTC in an accredited college or university. Became an active Senior Member of CAP and be recommended by the Unit Commander. CAPR 39-4 (dated 6 September 1971) offered one new observation, that “…both members and non-members are eligible for this award.” This was also the first time that the award was identified as the Frank Borman Falcon Award in honor of Colonel Frank Borman, former CAP cadet, astronaut, and command pilot of Gemini VII and Apollo VIII. Although this award is partly in recognition of Cadet Program achievements, an individual must also meet criteria which are not associated with the Cadet Program. Therefore, this award is administered under the Senior Program. This is the only achievement award in Civil Air Patrol which can be awarded even though the recipient might no longer be a CAP member. For example, if a cadet drops his membership when he enters the Air Force Academy, he would still qualify for the award upon application to National Headquarters. There was also the new requirement that former Cadets joining the Senior Program had to serve at least one year as a member. Monthly Bulletin Number 12 (dated 4 December 1973) detailed the expansion of the eligibility for the Frank Borman Falcon Award. Specifically, the requirement for successful completion at the Air Force Academy was extended to the other Service Academies. The requirements for successful entry into advanced Air FOrce ROTC was expanded to include the advanced ROTC programs of the other Service branches. The Falcon Award of Civil Air Patrol is faint in my memory. The reason is that the award was considered at headquarters as a post-cadet program item. Therefore, it did not come under my direct supervision. As I recall the Falcon Award, it was designed to do two tings: (1) to establish a bridge between the successful cadet, a Spaatz Award winner, and Senior Membership in CAP; and (2) to provide for a continuance of that successfully cadet in the program that meant so much to them. My staff did the artwork and wrote much of the corporate documents that established the award. However, it really was a Senior Member initiative. The Frank Borman Falcon Award I received is #124 and was given at National HQ CAP on 7 January 1974. I received the Falcon Award in the fall of 1977 dated July (?) and unnumbered. So my question is if the Falcon Award was considered to be a senior member award, why does CAPM 39-1 say you can either wear your Falcon Award or your highest cadet award (Spaatz) but not both? On the surface, it seems that the Dec 1978 NEC guidance which deleted the award is in conflict with the 1972 decision which clarified the Falcon as a senior program award. It makes sense to me that a Falcon recipient should be able to wear his/her highest cadet award (Spaatz) and the Falcon as a senior program award. I wonder if anybody ever asked NHQ for guidance? Any Falcon Award winners want to take this one on? I’ll take on the action to contact NHq about the ribbon question. One would hope it’s just a simple change to the uniform reg. Nancy Melendez Camilo, Spaatz #297, Falcon #179 (if I remembered correctly). I got the Falcon as a Senior Member and accepted in the AFROTC Commissioning Program. So, as far as I know I am supposed to wear both. I hope it does not change. Most members recognized the Spaatz ribbon (nice icebreaker) more than the Falcon (if it was discontinued over 30 years ago). Tom, I hope you succeed on your efforts for clarification and hopefully NHQ will not remove the ribbon as a quick answer. I got the Falcon under the rules of 1975 and I should not be penalized for living this long. Right now, 39-1 says you can wear your highest cadet ribbon OR your Certificate of Proficiency Ribbon OR the Falcon Award. It doesn’t make sense to count the Falcon Award as if it’s a cadet ribbon when it was awarded as part of the Senior Member Program. I am guessing that because of the small number of people affected by this provision, no one has said anything all these years. I received my Falcon Award on 14 May 1979.